It's Tuesday again so that means another delicious treat tempting me in my kitchen! Dorie's vanilla ice cream was chosen by Lynn. Fortunately for everyone involved, all this takes is a minute on the stove and a quick spin in the ice cream maker to yield a delicious and adaptable treat. I made this recipe last summer and over cooked the custard. This time, in fact, it only took about thirty seconds on the stove after tempering the eggs to get the mixture hot enough. I guess I'm learning after all. When I made this before I thought it needed to thicken up almost like pastry cream does, but mine was at the right temperature just after putting it back onto the stove- it was thick like egg nog (but much tastier!) I skipped past vanilla to the playing around options- choosing cinnamon because I tried it in Paris long ago and it was the best I've ever had. Honestly, I really didn't eat any bad food in Paris. The French are just good like that. But that cinnamon ice cream was exceptional. Grab the recipe here or at Lynn's blog. And go make it. I'm hoping to try the mint chocolate chip recipe next and will post it when I do. Then I'm thinking of adding in my banana to a batch of vanilla. And maybe I'll make a peach variety, they are coming soon after all. I don't think you can go wrong with this great vanilla ice cream. Now for the giveaway. MyBlogSpark has given me one gift pack for a reader. 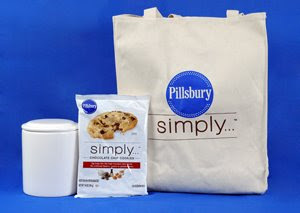 It features new Pillsbury Simply Cookies, a nice reusable shopping back, and a cute cookie jar (that I filled with "potty treats" for my little man who is almost all trained- yeah!). I bought the peanut butter cookies to try and made regular cookies (my husband's favorite) and some little cookie cups to eat the ice cream from. To make those, I just flattened out one cookie and placed it inside a greased muffin tin. I baked them at 350 (same as the cookies) for about 9 minutes and they popped right out. They are cute and would make a fun dessert, especially topped with some chocolate syrup and your favorite ice cream. I love making cookies from scratch but I'll admit these are pretty fast and perfect for a quick dessert like this. With summer craziness it's nice to have quick desserts up your sleeve. I'm going to have a series of recipes up for quick dinners to go along with this theme because I know we aren't the only ones running around and thinking of dinner only when our stomachs start to rumble. A cookie cup? Filled with cinnamon ice cream? Wow. WEll done. My favorite summer meal is watermelon/tomato salad. Nice work on the cinnamon ice cream. I am glad I am not the only TWD reader with a cookie jar filled with potty motivation treats for my toddler son! I love quick tomato and basil salads with a little olive oil in the summer...easy and just so summery and fresh!! your ice cream sounds wonderful! I love cinnamon! I just got an ice cream maker in june. I don't know how I lived without one. My favorite so far has been the coconut sorbet. But that cinamon looks amazing. That will definitely need to be tested soon. nothing better in my book! The ice cream sounds super yummy and what a cute heart-shaped bowl you got there! Oh, you chose cinnamon, I'll try that next. I love peppermint stick ice cream but it's hard to find! There IS no bad food in Paris, I am convinced. And Berthillon ice cream! The best! A cookie cup is perfect for vanilla ice cream. My favorite summer meal is Superman taking me out to eat...or him grilling something. I have that same bowl! Well, I used to have a red one, but I broke it. This is the second time I've seen cinnamon ice cream, and I'm totally intrigued by it. My favorite ice cream would have to be chocolate. No question about it. Ooh, I will have to make this ice cream again and try the cinnamon next time. Yum! That's the other thing I like about it is how versatile it is. I just throw in whatever veggies and cheese I have in the fridge and voila! Dinner in no time. My favorite quick summertime dinner is a panzanella salad. Ripe, homegrown tomatoes, fresh basil, crusty bread, mozzerella cheese, olive oil and vinegar...Yum! I'd love to win- I've been wanting to try the cookie dough. Nice pic- I made cinnamon too! Cinnamon ice cream sounds great. I love that last picture. My favorite summer meal is Caprese Salad. I can live off it. Fresh tomatoes and basil from the farmers' market. Great mozzarella.YUM. How fun! And what a great idea. I'm trying to potty train my little boy right now!! My favorite summer meal is grilled chicken and veggie kabobs. Yum! My favorite ice cream is mocha chip. Mmmm....i'm totally craving it right now. It's so so good!! And I love those cookie cups. Never seen that before. I made cinnamon, too! It was really good. Great presentation, Anne. Looks great! I love caprese in the summer! Especially when my husband makes it! yum! Love the cinnamon addition! My favorite ice cream is just plain 'ol vanilla! I recently tried Starbucks Ice Cream, its really yummy! Oh my that cinnamon ice cream would be delish with apple pie. the perfect pair. We love homemade ice cream around here! We make one that tastes just like Wendy's frosty! And sometimes we add chipped up Butterfinger Bars! YUM!! That ice cream looks super yummy! Well, I used to like every ice cream, but didn't care for vanilla much. But this recipe definitely changed my mind. Yummy. With bananas great (and considering next weeks pick....) Peaches!! Double yum. The cinnamon flavor sounds delicious and it's super-cute in the heart bowl. I did the same thing the first time I made a custard-based ice cream, this one came together exceptionally fast. My favorite ice cream this summer has been buttermilk. I love cinnamon and I bet it was amazing in that cookie cup! We loved this ice cream, and like you, I have lots of plans for making it again. Yum to the TWD Cinnamon ice cream. Favorite quick summer meal? We like to grill burgers. Oh, I love those cookie cups! And I wish I could have made cinnamon ice cream -- I love cinnamon, but my husband unfortunately does not. My favorite summer meal is orzo salad with chick peas and feta; you can eat it warm or at room temperature, and it's delicious! I made Cinnamon Ice Cream too! Yours looks fab, especially in the cookie cup with - is that cinnamon chips too?!! Delish! My fave summer meal is pizza on the grill! Make or buy fresh dough, throw on some sauce, cheese and when you take off the grill, rip up some fresh basil leaves on top. Yummy! The cinnamon ice cream sounds fabulous! Ooooh cinnamon ice cream sounds so good! I'll have to give that one a shot! I love the cookie cup you created - my husband would be a huge fan. My favorite ice cream flavor is mint chocolate chip so I look forward to your post if you try it! Yum. Homemade ice cream is the best! My fav is the brown sugar ice cream from epicurious.com with some chocolate covered almonds mixed in at the last minute. 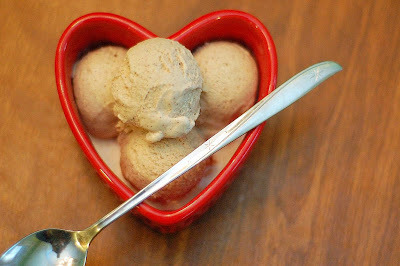 Cinnamon ice cream - I keep seeing this variation and kicking myself for not trying it - it sounds and looks amazing! Oh, cinnamon ice cream...super yummy. My favorite summer treat is actually shave ice (Hawaiian snow cone with thinly shaved ice). I love butter pecan - but not just any butter pecan - the kind where you can taste the salt on the pecans! That is the best! My Favorite ice cream? EASY PEASY!!! Chocolate!! Is there anything else? LOVE IT!! Thank you for a Delicious Giveaway! YUMMY! For ice cream: Combine milk and mint in heavy medium saucepan and bring to simmer. Remove from heat. Cover and let stand 30 minutes. Mix in cream. Using electric mixter, beat egg yolks, sugar and salt in large bowl until pale yellow and slowly dissolving ribbon forms when beaters are lifted, about 3 minutes. Gradually beat in milk mixture. Return mixture to same saucepan and stir over med-low heat until custard thickens and leaves path on back of spoon when fingers in drawn across, about 6 minutes; do NOT boil. Cool. Strain through sieve into clean bowl; cover and chill. Process custard in ice cream maker according to manufacturer's instructions. Transfer to covered container and freeze (can be prepared 3 days ahead...I never have so I can't say how it will be). For sauce: Melt butter in heavy small saucepan over low heat. Whisk in cream, sguar cocoa and salt and simmer until sauce thickens slightly, whicking frequently, about 5 minutes. (Can be prepared 3 days ahead, rewarm over low heat). When I think of summer meals I think of anything on the grill: juicy hamburgers, marinated chicken, shish kabobs...yum! My favorite ice cream is a toss up between Tillamook Brown Cow (now called Udderly Chocolate but I prefer the former name!) and Tillamook Marionberry Pie. Oh, momma! I love a good BBQ...mostly because that means my husband is in charge of cooking! I would say my favorite summer time meal is BLT's with fresh tomatoes from my garden. 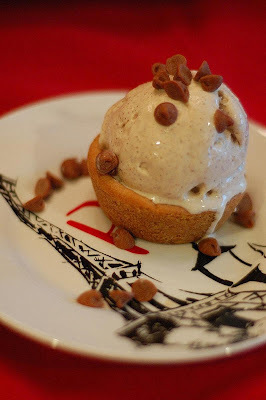 What a great idea - the cookie ice cream cups look wonderful. And now I'm sure I have to try the cinnamon variation of the ice cream. I'm too late for the giveaway, but I'll tell you anyway - my favorite quick summer food is corn on the cob. If you eat enough of it, it's practically dinner!